Salad Days: Stinging Nettles: The Weed with Bite! 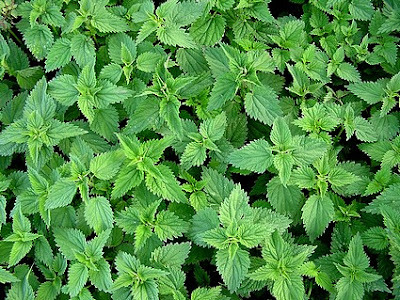 I have fond memories of a childhood summer spent in a tiny Croatian village, running through grassy fields and occasionally, and oh so painfully, encountering a patch of stinging nettles. More commonly referred to as the ‘scorpion of the weed world’*, I never would have imagined that nettles (Urtica dioica) would come to one day play such a major role in my daily diet. Their culinary use dates back many centuries, widely used in both cooking and for medicinal purposes in Ancient Greece and Rome; today you will find nettle-based dishes everywhere, ranging from a little old grandma’s table somewhere in Eastern Europe to gourmet restaurants worldwide. I consider nettles to be a true superfood, ranked way up on the charts with my all time favourites kale and hempseeds (more stories and recipes for another time!). When espousing their many wonderful benefits, it is hard to know where to begin – they are just so very good for you, in so many ways. Particularly rich in iron and vitamin C, nettle leaves are also a good source of calcium, magnesium, B-vitamins and betacarotene. Considering how irritating and stingy this little plant can be, leaving nasty and itchy red welts in its wake, it is curious to know how widely used and effective nettles can be for treating hayfever and inflammation. With a tried-and-true reputation for conquering seasonal allergies, nettle is thought to reduce the amount of histamine produced by the body when exposed to allergens, subsequently quelling dysfunctional immune responses. Additionally, nettles taken both internally and externally have been shown to provide relief from inflammation, such as that associated with arthritis, fibromyalgia and gout. Reducing high blood pressure, due to its diuretic activity. Pain reduction in conditions associated with inflammation (directly associated with its anti-inflammatory actions). Healthy skin, hair and nails when consumed or used topically. Useful in acne and eczema. As a female tonic, particularly effective in conditions of heavy bleeding and used to stimulate breast milk production. Also as a male tonic, boosting vitality and energy. A powerful antioxidant, effectively inhibiting nasty free-radical activity and reducing the load carried by the liver and other channels of elimination. Antimicrobial activity, both orally and topically. Beneficial in benign prostatic hyperplasia due to the ability to reduce the activity of hormones which directly contribute to this condition. Convinced yet? Now, all we need to do is get your (gloved!) hands on some, because, unlike some of our more ‘conventional’ superfoods, nettles aren’t really something you can pick up from your local organic grocer (though, if you find one, let me know!). If you can gain access to some seeds, nettles will grow with wild abandon most anywhere you plant them. They need to be controlled to a certain degree, as they will happily take over your backyard if given free reign! If you must have them immediately, a wander in most paddocks or unkempt backyards should produce an abundance for wild-crafting – just be sure they have not been exposed to pesticides, herbicides or other nasty environmental pollutants. When you’ve found yourself a healthy crop, approach with extreme caution! Wear rubber gloves to protect against the sting (though the younger plants should be sting-free), and pick what you need from the top of the stalk. The best time to harvest nettles is during the springtime, before flowering, when they are thought to be at their peak nutritive state. So now you’ve got your nettles, what to do with them? With their irrefutably earthy and ‘green’ flavour, these are a joy to use in cooking, incorporated wherever you may use spinach, or kale – pasta, pesto, risotto, soups; the options are neverending! You’ll be thankful to know that upon cooking or juicing this little wonder, its spiky little stingers are destroyed, a blessing for your tongue! 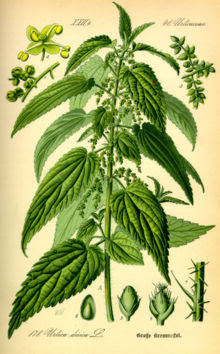 Nettles can also be purchased dried, or dried at home. 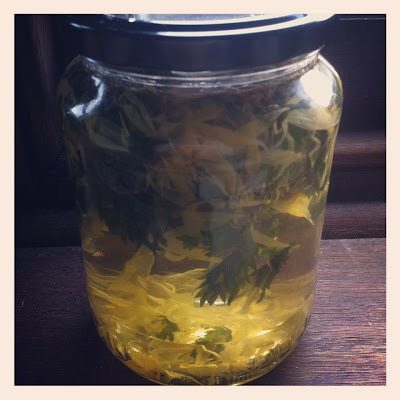 Drying nettles allows you to make yourself regular nettle tea or infusions. Infusions are made by adding about 500ml of boiling water to a loose cupful of dried herbs (I use an old, glass pickle jar!). Screw on a tight lid, and leave the herbs to infuse for anywhere between 4-10 hours. Leaving them overnight is perfect. The next morning, strain the plant material, squeeze well, and enjoy! Reheat if you wish, or serve as an iced tea with a squeeze of lemon. Any leftovers can be used as a hair tonic or to water your plants! Drinking 2-4 cups a day is usual. Stay tuned for a series of delicious and nourishing recipes involving nettles! Coming soon! If you'd like to incorporate large quantities or high doses of nettles into your therapeutic plan, please consult with your naturopath or herbalist.